Looking through my memory card of the last few outfits I remembered to photograph, I saw a theme. Even though I enjoy shorts, jeans and pants, there’s something so easy, comfy and fun about a casual cotton skirt. And better yet, often find them at yard sales for $1 – 2. I get a lot of comments from you all saying you aren’t a skirt kind of girl. My question is “Why not?” Now, these outfits that I have pictured this week are worn dressier, but I wear casual skirts with T-shirts all the time, just like I would shorts. Often, they are much more comfortable, especially in the summer because of sweat with shorts, which I won’t mention. Pictured above was my find from last week. A light, cotton skirt for only $1. The seller was a much smaller size than me, so unfortunately, nothing else would have fit, but because this skirt had an elastic waist, I thought I would take a chance, and I am glad I did. The cost of the total outfit? $10….yes, only $10 (with shoes and necklace). The white shirt, cotton skirt and ITALIAN LEATHER, like new purple sandals were all yard sale steals totaling $4. The wrap was a thrift store find for $2.75 and paired with the fun pink necklace, it brought the total to only $10. Besides the detailed embroidered flower on the skirt making me just happy because it’s gorgeous in real life, the cost, makes it that much sweeter of a find. Now, since most of you know I am challenging myself to 30 days of healthy living right now, with the hopes of dropping some of my added pounds and starting to exercise again, I want to point out how I manage to cover up much of that extra weight gain. I’m taller, so admittedly, it’s a bit easier I suspect. The picture of the pink and weight outfit was taken the same week as this one with the green shirt, and yet I look ten pounds heavier in the second photo. The key to “instant weight loss” in fashion is creative concealment. 😉 By wearing a wrap that hits right above the waist line, it not only covers up my side muffin top, but draws the eyes away from it, therefore slimming the whole line of my waist, and covering what should be covered. I love the look of the second outfit, but I added a thin sheer, white, cotton cardigan over it, and it was perfect. (I should have taken a pic…ugh). Again, this skirt has a very detailed embroidered flower, a bit bold, but it was fun and came from a boutique store. I bought it at Goodwill for $3.75, and I am sure originally it was a pretty penny. The green tank was $0.50 at a yard sale, and these unique designer shoes were only $2 at a “rich person’s yard sale. (And yes, I was at this yard sale for over an hour and got some GREAT treasures..to be shown later.) These shoes are so unique. The detail is exquisite in real life. I have a lot of black skirts, but this one is made out of of that “so soft you can sleep in it” cotton, and I just love wearing it…a lot. I wear it to church (like here). I wear it as a swim suit cover up. I’ve even have worn it gardening, oh yes, I have. This was one of the best dollars I have spent at a yard sale. Pair it with a silk, dressy thrifted purple top for a pop of color, and a great statement piece necklace, and you have another outfit for under $10. This necklace was new, but I got it for $5 online. You can see it up close on this video of our upcoming frugal living – Becoming Conference. 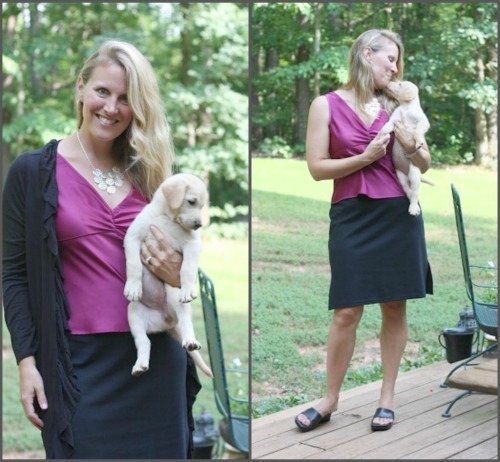 The following pictures and thoughts were taken from a post last year (and over ten pounds ago), but again, it shows how fun and versatile skirts can be. I’m just going to say it…I was giddy when I found this skirt, oh yes, I was. The possibilities are endless. Getting ready for church and running really late, (yes, I literally left the house with soaking wet hair), I grabbed the first shirt that matched – white. But this style would be spectacular with turquoise, light blue, black, brown, green, or orange. I have at least eight shirts that would match and it can be worn all year round – dressed up or down. Again, remember that sizes when thrifting really varies. This skirt is a petite and I am on the tall side. Assuming it would be too short, I tried it on anyhow since I LOVED the fabric. I guess it’s meant to be worn longer, but I snatched it up anyhow…for just $2.99 (Carolina Thrift). Remember my tip about trying on various sizes? This shirt is a prime example. It’s a much bigger size than I would typically wear, but since I purchased it at a yard sale for $1, I wasn’t about to pass it up. A classic white shirt is one of my core wardrobe pieces and this style flatters any size. Because it ties on the side, I cinched it tight and love it! Even when I was 40 pounds heavier, this same shirt would have fit. A $0.50 yard sale Liz tank is layered underneath for modesty. So what about you? Are you ever a skirt kind of girl? Either for dressy occasions or even day to day fun? I have terrible luck finding yard sale steals. Every one I go to they are selling kids clothing for around $5 a piece, even adult clothing is way too much! Those are great outfits- I’m jealous!! I love skirts. I have very ugly legs. I was a dancer, tennis player, roller skater and somehow ended up with cankles, awful vericose and spider veins and yucky cellulite. Shorts make those things look so much worse. So it’s long pants or skirts that are at the knee or below for me. I bought a flowy white skirt at Old Navy years ago and it’s a few-times-a-week staple. It goes with practically any shirt. Then recently someone gave me a like-new black skirt with black flower…embroidery, maybe. That matches anything too! I love your creative concealment ideas. Jen…I find that you are so right about skirts. Very comfy while running errands or even playing with the kids, but gives you a more polished, put together look than just throwing on some shirts and a t-shirt. Plus, how fun do we feel when wearing a sassy, little flouncy skirt—even while grocery shopping (ugh)? Keep the frugal fashionista posts coming, girlie! I love these and find them inspiring…. Nothing is TMI here. 🙂 If I have to wear a slip with it, I don’t buy it. Now, I have been known to wear control top underwear, but for cotton skirts, they don’t need a slip – they just hang nicely, and they aren’t that light that they are see through. @SarahMay, There are slips that look like shorts that are perfect for under skirts. They are silky and light weight and they stay put because they are shorts, and you’ll be ready for a gust of wind if you’re outside. I have found them at department stores like JC Penney, Kohls, and Younkers. I almost always wear a slip under skirts–especially if I’m wearing them to work (I’m a teacher) or church. Skirts flow better when they have a slip under them, especially if they have “spin-ability.” As fall comes, I wear a lot of leggings, so a slip is necessary to keep the cotton skirts from catching on the tights or leggings. I couldn’t agree more… I practically live in skirts and dresses year round. 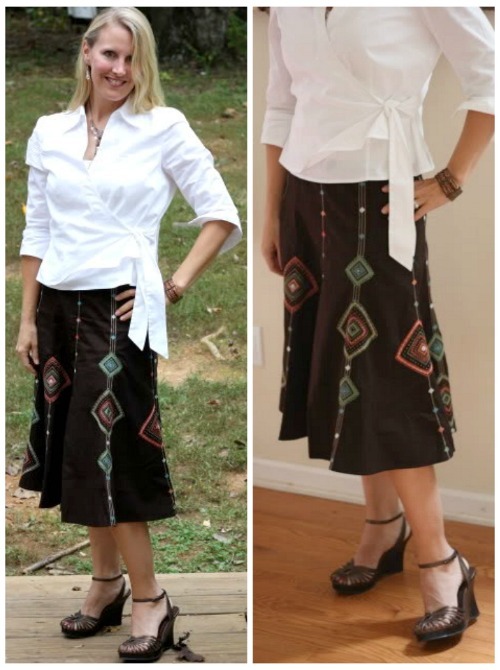 They’re easy, comfy and a great way to help me look “skinny” even when I’m not feeling “skinny!” And, I LOVE that brown skirt – what a great find! I am definitely a skirt girl in the summer for the same reasons as you shared. I just have a hard time finding cute skirts – hopefully between the 30-day challenge and putting some more effort in thrift shopping, I can expand my skirt options. I wear skirts and dresses more than shorts. I find that they are more comfortable, more flattering and take the day’s outfits up a notch. I live in a part of the country where anything goes for clothing (in fact we were named one of the worst dressed areas at one time) so why not take the effort to look a little more feminine and put together? I don’t even own a pair of shorts anymore, I have to converted to cute knee-length skirts for summer. All of which I paid $5 or less for, either thrifting or clearance rack at a surplus store. I wear them gardening, cleaning, playing with my kids- MUCH more comfy than shorts- I agree! I love skirts to! I have a good sized collection of fun printed cotton skirts that I picked up (for only a few dollars each at my favorite thrift store) 2 summers ago when I first discovered your Frugal Fashionista series. I can mix and match them with solid colored tee shirts and I feel more put together if I just have on shorts and a tee shirt. As an added bonus, it’s not the end of the world if they get overly worn/messed up from playing with my toddlers at the playground. They were only $2-$3 each and I know that I can always find more at the thrift store or Goodwil. Meant to say that I feel more pulled together THAN in I have on shorts! I LOVE skirts and casual dresses. I love your pink wrap outfit! Beautiful! Thanks for the inspiration! Help please–what do you do for slips? The polyester ones are hot & sticky in the summer and I haven’t found anything cotton to give me some extra coverage. Hate to add another layer, but these cute summer skirts sometimes need it. Any ideas?? I’m such a huge skirt gilr that at last count I had 30…I know! My reasoning is that some of them are fall/winter (probably half?) and the rest are spring/summer. I find skirts much easier to wear especially if I feel “fat”. Though, when I do find a pair of pants I love I wear them a lot! Those Italian-made shoes are so gorgeous! 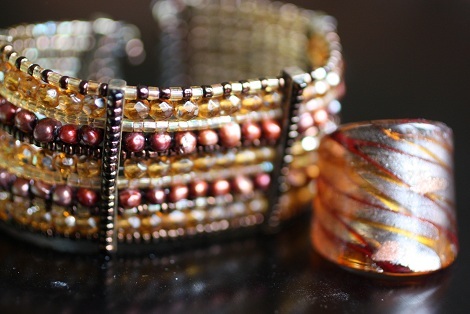 I love the beadwork. I need to wear more skirts, esp. because I don’t wear shorts. The few skirts I own my sister gave to me but I feel like they make me fatter. Ugh! I’m such a petite pear shape that summer skirts just make me look like a little girl. The only skirts I look good in are pencil skirts with heels , which is not practical for every day unless I worked in an office. I also look good in long skirts with boots. But summer skirts never seem to look right on me. BTW, I love your daughter’s mismatched socks in the first set of photos. 🙂 I love how they match your shoes and skirt! With the unprecedented heat I have been wearing skirts and dresses more this summer. They make really make it really easy to look pulled together. Even if I put my hair in a bun or pony tail. I was definitely a dress and skirt girl before I had kids, but got away from that as a mom of little ones until I figured out to wear bike shorts under my skirts. No more worries about toddlers lifting my skirts to hang out under the skirts. I love skirts in the summer too! This summer I’ve definately transitioned away from shorts unless I’m gardening or housecleaning. I find lots of great skirts (GAP, Banana Republic,Calvin Kelin sport, Ann Taylor) in great condition at my GW…most seem barely worn. I throw on a simple tshirt and sandals and feel much more pulled together. I think people think of skirts as for “dressing up” so maybe that’s why they always look like new at the GW. Love your Frugal Fashionista posts! So inspiring! I’ve never been much of a garage sale girl, but you make me want to try it because you find such great things. 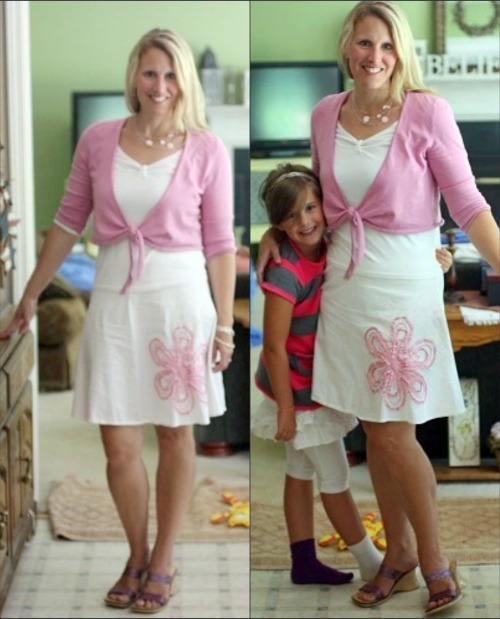 Love the pink and white outfit and that black embroidered skirt (and the white shirt too!) You well put together – that is what I love the most. Great inspiration.